High-velocity spray venturi scrubbers are a traditional and well-known method for removing fine dust particles from industrial air streams. Venturi scrubbers, are often installed to remove fine particles from volatile, hazardous or corrosive gas streams, or gas streams containing solid materials that are difficult to handle. 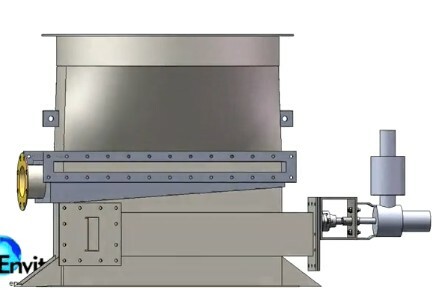 A Venturi Scrubber accelerates the waste gas in order to atomize it components. 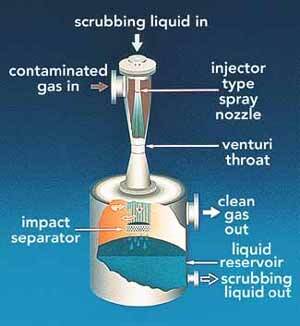 In the "throat" section of the Venturi scrubber the gas velocity increases because of the narrowing of the throat before it expands again. Water is introduced to the gas stream in this throat section and is atomized into small droplets from the acceleration in the scrubber. 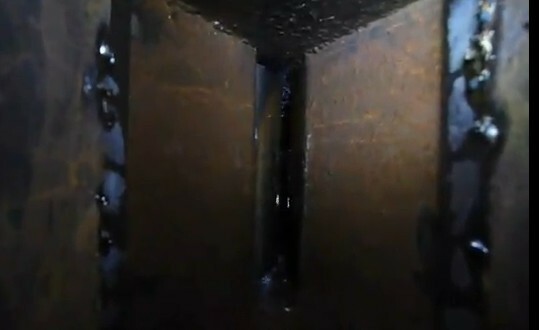 As the water particles go through the scrubber, small waster ducts from the gas stick to the water and is collect.